Thomas Aquinas (1225-1275) took the contemplation of God and of God's creation very seriously. He is famous for the way in which he intellectualized the Catholic tradition. The purpose of his great intellectual syntheses is to contemplate God and God's creation in their objectivity. That means to explore God and God's creature in minute detail as things which exist and have their value in their own right, outside of our human interest in them or our feelings about them. The purpose of his contemplation of God and God's creation is to explore God, the Trinity, and the beings which God has made as they are in themselves. In the earliest twentieth century the German philosopher Edmund Husserl and his students coined the expression 'back to the things themselves.' This is the heart of Thomas Aquinas' enterprise as a theologian. To meditate on God himself, and on creation itself, without bias and without constantly returning to what God and creation mean to me and to my human projects. This is the point where many authors will feel obliged to say, 'but don't worry, there's nothing cold about this. Its all about spiritual ardour and its all very enthusiastic in its own quiet way.' I'm not at all sure that Thomas Aquinas' apparent lack of emotion conceals depths of swelling affectivity. I tend to think that he writes a direct, objective, analysis of God because that is what he finds most spiritually satisfying and most spiritually meaningful, and that its pointless to pretend otherwise. There's dozens of other saints who are drowning in affectivity if that is what you are looking for. A little over a decade ago, I translated a book by Gilles Emery called The Trinitarian Theology of Saint Thomas Aquinas (OUP). The author has one fiercely Dominican footnote in which he writes that Thomas Aquinas did not need to do extra spiritual exercises because his examination of the Trinity is a spiritual exercise, in and of itself. Emery's book is nothing more than a commentary on Thomas' work, with hundreds of long quotations from Aquinas' treatises on the Trinity. I can say without doubt that the two years I spent translating for an hour or so a day it were two years in which I contemplated the Trinity, day after day, in the most rigorous and thoughtful way. Thomas Aquinas' contemplation is a minute investigation of every angle he can think of to look at his subject. My 'chair' at that time, the great Protestant theologian John Webster said that Thomas deals with the Trinity as if he was cutting up a pie. He meant no disrespect to Thomas in saying that. He meant that for Thomas, the Triune God is an immensely mystery but still to some extent known entity. Thomas Aquinas contemplated the Triune God, and God's creation, and he wrote his great works of theologian synthesis, in order to render God and creation known rather than unknown to human beings. Thomas knew that the only reason why we know anything about the Tri-Une God is that God has revealed himself to us in history, and through his Son. So Thomas did not intend his reflection on the Trinity to render what was previously sheerly 'unknown' known. He meant to articulate with the greatest clarity what we know about God through revelation so that we can say what it is that we know about God. We do not fully possess our knowledge until we can actively articulate it for ourselves. Saint Thomas' great labour was putting into our own human words the Word that is revealed to us. So now someone is dying to tell me that just before he died Thomas Aquinas had a vision of God, and confessed that, by comparison with what he had seen 'everything I have written is of straw'. And he wrote no more. 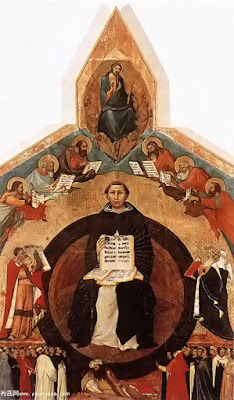 It seems fair to say that the only person who could have had precisely the vision which Thomas Aquinas had a fortnight before his death, was Aquinas. He made that vision of the immense, unknown mystery of God possible by articulating with infinite care everything that he could himself make known and sayable about the Triune God and about God's creation. 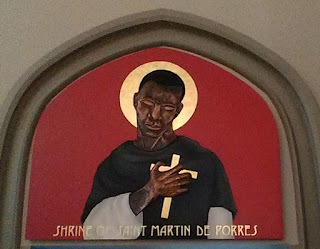 If you are going to read a book about this great Dominican saint, let me recommend two. First, a two volume biography by Gilles Emery's teacher, Father Torrell: Volume I, Thomas Aquinas: The Person and his Work, and Volume II, Thomas Aquinas: Spiritual Master (CUA Press, translated by Robert Royal). If you are a good bit more advanced, and you do need to be a bit more advanced, you should read Gilles Emery's book on Thomas' Trinitarian theology. If I were you, I would not try reading the Biblical commentaries. They are deadly boring. Sometimes people try to rescue Thomas from his reputation as an intellectual saint by talking up the Biblical commentaries. Take a look at one of them before you start, is all I can say. You will see that Thomas first talks about how he could cut the cake in three, then he talks about how the 1/3 of a slice could be cut in three, and so on, and on. There are beautiful paragraphs here and there, lovely sayings. But most of it is really hard work. Nobody ever did themselves any harm by reading Chesterton's biography of Saint Thomas. I love the scene of Saint Thomas at the court of King Louis. It is great literature. How much of it has anything to do with Saint Thomas is a moot point. Yes, I know that Gilson and others said when Chesterton published his book that it was the world's best book on the Angelic Doctor. I do know something about how these tributes for publishers are elicited. Grumpy is a professor of theology in the Midwest. We met on Light on Dark Water and then in person this summer, which was quite a treat. If you want to see all of the posts in this series, click HERE. Thanks you for this, Grumpy. It's very good, of course, and there is something I want to say about it, but I've been trying to figure out how to say it all day, but have not yet been successful. This is the point where many authors will feel obliged to say, 'but don't worry, there's nothing cold about this. Its all about spiritual ardour and its all very enthusiastic in its own quiet way.' I'm not at all sure that Thomas Aquinas' apparent lack of emotion conceals depths of swelling affectivity. I tend to think that he writes a direct, objective, analysis of God because that is what he finds most spiritually satisfying and most spiritually meaningful, and that its pointless to pretend otherwise. I like that. Mostly because I'm (sadly) fairly deficient in the "swelling affectivity" department. That quoted paragraph from Chesterton's book is wonderful, and makes me want to read more. Sorry for being so late to reply to this. Two comments: one, this is a great post. I'm sending it to a fundamentalist I know who's pretty suspicious of Aquinas. This may not actually make him less suspicious, but he'll be clearer. Two: Grumpy, are you familiar with a 4-volume Companion to the Summa by Walter Farrell, O.P.? I got it years ago at a library discard sale and have never done more than browse in it. It's very engaging, very well-written, but I don't know how well it serves Aquinas. Thanks for this, Grumpy. I really dislike the assumption that intellectual contemplation (and knowledge in general) is dissociated from love and holiness or even opposed to them. 52 Saints ~ February Posts?